The Group Benefits Plan consists of the Health and Dental Plan and the Group Life Insurance Plan. Group life, health and dental benefits are provided by Sun Life Financial. Details of coverage are described in Your Benefits Plan booklet. Download medical claim form in English and French. Download dental claim forms in English and French. GuidanceResources is an added benefit for members of the group benefits plan that give members and their families confidential support, resources and information for personal and work-life issues at no charge. These services are strictly confidential and are available to you and your immediate family members 24 hours a day, seven days a week, by phone or online. You must be registered to access GuidanceResources Online. If not yet registered online, click here for registration instructions. If you are interested in learning more about the program through viewing an Employee Orientation Webinar, please contact our Communications Coordinator – 1-800-619-7301 ext 230. Our EAP has many helpful resources, from financial education to mindful living tips. Check back here for updates and highlights of new content! other important documents, and try to get an early idea of how much you will owe or be refunded. You want to schedule enough time to complete your return and avoid the April 30 filing-deadline rush. planner or tax attorney for a complex return. on your province, contact your nearest CRA office. Member Contributions: Members contribute a percentage of their pensionable income to the plan every month by payroll deduction. This percentage is approved each year by General Assembly. Read more on page 4 of Your Pension Plan. Employer Contributions: Your congregation or employer also makes contributions to the pension plan. The amount of employer contributions is approved each year by General Assembly. Read more on page 4 of Your Pension Plan. Retirement Age: Normal retirement age is 65. You can retire anytime after you reach age 55 with a reduced pension. Retirement can be postponed anytime after age 65, but under current law, pension payments must begin no later than the year in which you reach age 71. For more details on retirement age, early retirement or postponed retirement, see page 5 of Your Pension Plan. Amount of Pension: Your pension is based on a formula that uses your pensionable income, income ratio, pensionable service, and maximum qualifying income. Read more on page 6 of Your Pension Plan. If You Leave: If you leave the plan before you are vested, you will receive a refund of your contributions plus interest. If you are fully vested you are entitled to the commuted value of the pension you have earned. Read more on page 11 of Your Pension Plan. Annual Pension Statements are sent to all members each May. 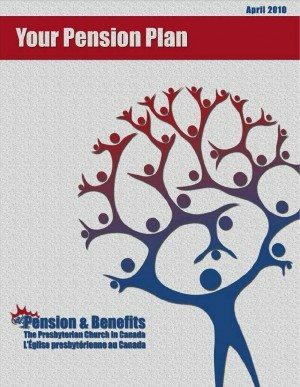 Your Pension Plan booklet (2016) provides information about The Presbyterian Church in Canada’s pension plan. Have questions about retirement? Have a look at our Retirement and your PCC Pension Plan resource here. Window…on your Pension and Benefits is a newsletter for active members of the pension and benefits plan, and is published each spring and fall. This newsletter contains details of health and dental benefits, messages from the Pension and Benefits Board, and important updates regarding the pension plan. Important Reminder: Are your beneficiaries up to date? If you have any questions or suggestions regarding this newsletter, please contact us pension [at] presbyterian [dot] ca. Continuation of Pension and Group Benefits Form – Members must complete this form prior to leave declaring their decision to stay in / suspend participation in both the pension plan and group life insurance benefits. Members can choose to opt to stay in one and not the other. Regardless of their choice, health and dental coverage will be maintained. We want to know how to serve our members better. Is there something that we are missing on our website or in our newsletters? Let us know! Please complete our short survey and let us know how we’re doing and how we can improve. 1. Go to guidanceresources.com and click the Register tab on the home page. 3. On the next page, you will be asked to enter the first five (5) characters of the name of your organization: Presb. When you’ve finished, click the Submit button on the bottom of the page. 4. On the next page, you will be asked to select your organization – Presbyterian Church in Canada – from a drop-down menu. When you have finished, click the Submit button at the bottom of the page. 5. You will then be asked to enter a User Name and Password. Both can be anything you would like but should be something you will remember. The User Name (often your name) must be at least six characters long and should have no spaces (ex. joesmith). The Security Questions are meant to prompt you if you forget your password. Make sure that you complete all required fields. When you’ve finished, click the Submit button at the bottom of the page. 6. You should now be registered on the website. If you have any problems registering or logging in to GuidanceResources Online, email Member Services at memberservices [at] compsych [dot] com.